The spread of the Invasive species Himalayan Balsam has been the target of a community intervention along the River Nore in the Kilkenny City area and its tributary the River Breagagh. Himalayan Balsam is one of Ireland’s most invasive plant species and is considered to be a threat to wildlife ecology along rivers especially their riparian areas, and so is an issue that should be addressed under the Water Framework Directive. Removing Himalayan balsam is not straightforward and requires a lot of man power, community and river stakeholder intervention. The Tidy Towns Committee, Keep Kilkenny Beautiful and its Biodiversity Committee first targeted Himalayan balsam which had become rampant on the River Bregagh, which is a tributary of the River Nore flowing through Kilkenny City in 2015 . The River Breagagh is a tributary of the River Nore which rises to the south west of Kilkenny and meanders through the greater southern and western environs of the old city and flows under city walls and Abbeys where it joins the River Nore. Community volunteers cleared the upper part of the affected areas in the months of June and July in 2015 and 2016 and concentrated on preventing any re-emergence in this area for the remainder of the year. 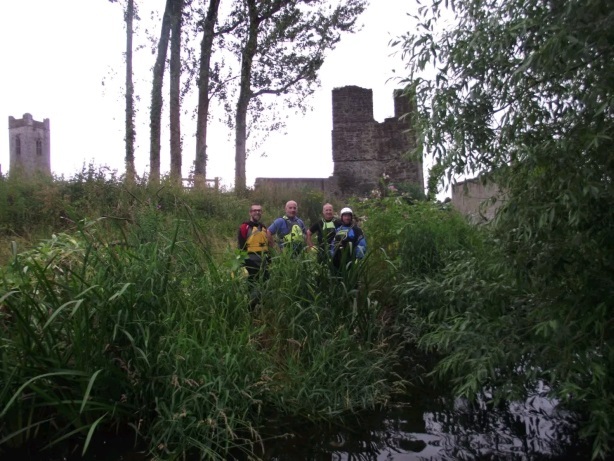 Progress on the first year of the River Breagagh Himalayan balsam campaign would have been greater but for an outbreak of Giant hogweed on the River Nore to which a number of the Breagagh volunteers responded. A response to combat the Giant hogweed’s threat to public health and the rivers ecology was directed by the local National Parks and Wildlife Officer, and included individuals from the Tidy Towns biodiversity group, the Local Sub Aqua Club, the Kilkenny Anglers and the Local Canoeing Club. The result of this intervention was that 70 or so Giant hogweed plants were treated and their seed heads removed preventing them from going to ground and germinating. The same Giant hogweed response team have been proactive again this year and it is hoped that one invasive species epidemic has been averted and is under control. In May of 2016 the River Breagagh Himalayan balsam campaign resumed and the stakeholder groups that so successfully responded to the previous years outbreak of Giant hogweed spearheaded the completion of the removal of all stands of the invasive species from the River Breagagh tributary. 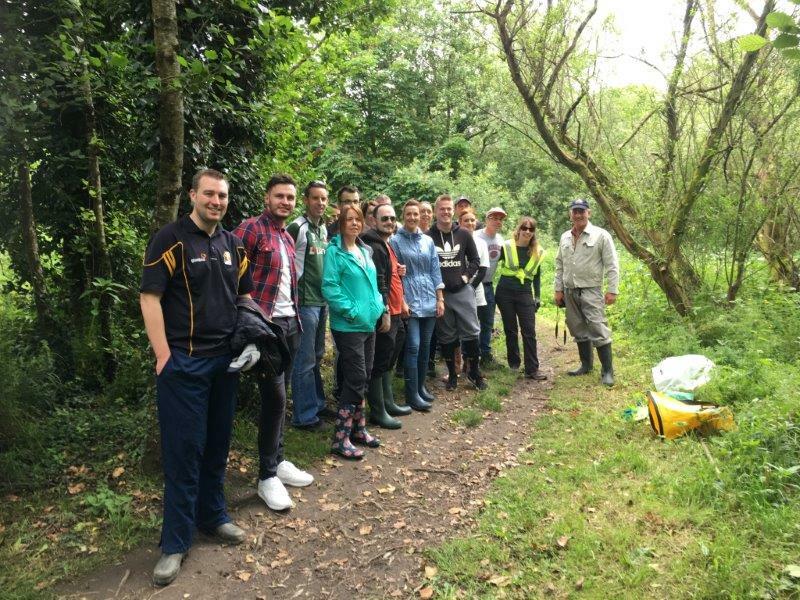 The important participation of the rivers amenity stakeholders in this difficult access phase of treatment also released experienced volunteers to participate in the removal of Himalayan balsam downstream of the River Breagagh confluence. 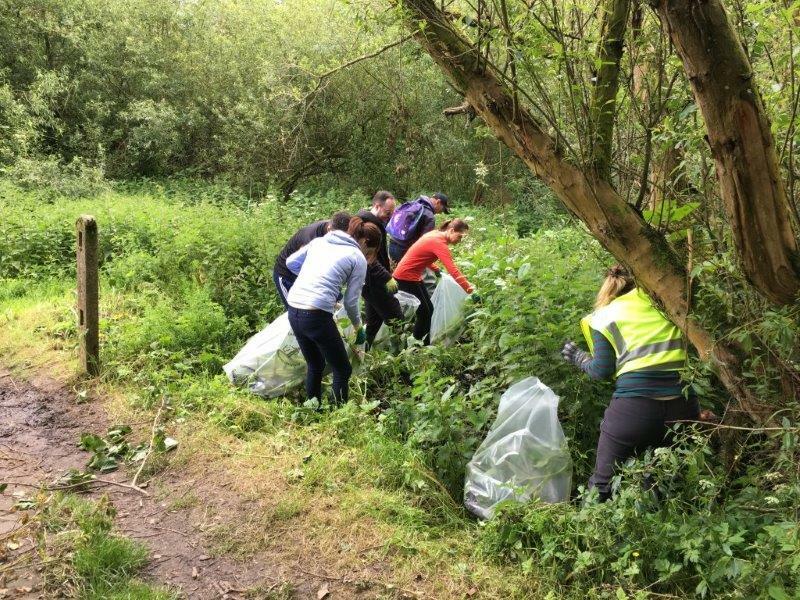 The Tidy Towns, River Nore Himalayan balsam removal campaign began in May 2006 on the popular Lacken and Canal walk areas of the river downstream of the River Breagagh and a strong community response has seen large areas of infestation being cleared and indigenous habitat being restored. Earlier removal of invasive species on the River Breagagh has already resulted in a return of nesting ducks and foraging swans to the restored grass leavey island and riverbank habitat and a return of a pair of squawking water hens to what had previously become an impenetrable forest of Balsam. The intervention and participation of Tidy Towns cross community volunteers and river amenity stakeholders in biodiversity advocacy projects is heralding a new dawn in river conservation on the River Nore and its tributaries in Kilkenny. In 2017 further extensive removals took place throughout the May – August season 2017 and in addition extending the work area down river to south east of the Ossory bridge with maintenance of other areas which had been substantially cleared in previous years. The main aim was to remove the plant prior to seeding and to pick as early as possible while its biomass level was low and damage/shadow to adjoining plants was minimised. As in previous years all of the plants were collected by hand and where composted on site adjacent to the river in locations above the floodplain.This work as allowed all to have a greater appreciation of the amenity available along the river Nore/Breagagh in the Kilkenny area.